Dining at “Septime” is like having a nice walk through flowering meadows close to the sea-side in Normandy: it’s fresh and airy, it’s charming, something really uplifting. 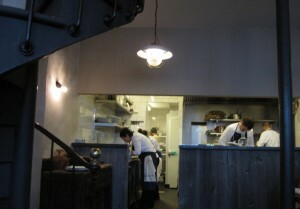 Go and enjoy the neo-bistro kitchen of Bertrand Grébaut and you’ll understand that French cuisine isn’t dead, at all. This is THE restaurant, the buzz of the moment. Grébaut, a young French chef, trained by Robuchon and Passard, opened it in May, and a month later you already need to reserve your table for dinner ten days in advance. That’s what you can call a hype. But is it worth it? Definitely. You can feel here the same respect for the product, the same care and love of preparing it as if you were to eat at Passard’s “Arpège” or at one of Robuchon’s “Ateliers”. But here it’s not about sophistication, it’s all about minimalism. Before opening “Septime”, Grébaut spent some time at the chic “L’Agapé” in the 17th arrondissement, a somehow cold and overprized place. His new venue on rue de Charonne, not far from Bastille, resembles him much more: a lovely modern space with a vintage twist and an open kitchen. “Septime” is the kind of informal restaurant with wooden tables and concrete walls you can find in Germany, the Scandinavian countries, in New York too. But the Parisians are just discovering them: The industrial references are always a bit too forced, but here it’s not showing off, it’s kind of cosy in its uncomfortableness. Let’s call it bobo, to keep it short. 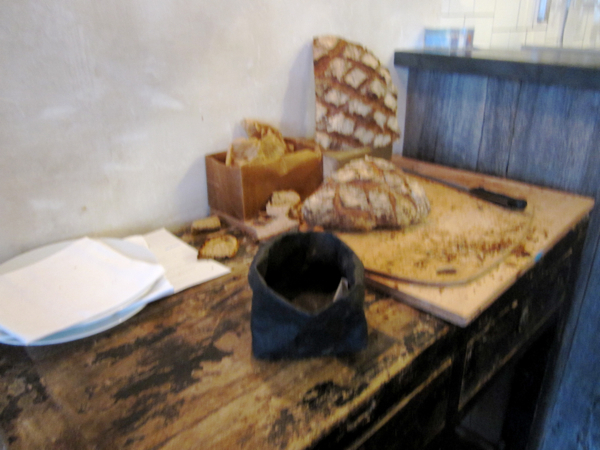 Grébaut is apparently enjoying refreshing the menu daily with seasonable products he finds on the markets. His dishes have no product name-dropping, he chooses simple ingredients of the best quality. There is cabbage, radish, there are simple fish, but this is the whole challenge: to do something extraordinary with very simple products. 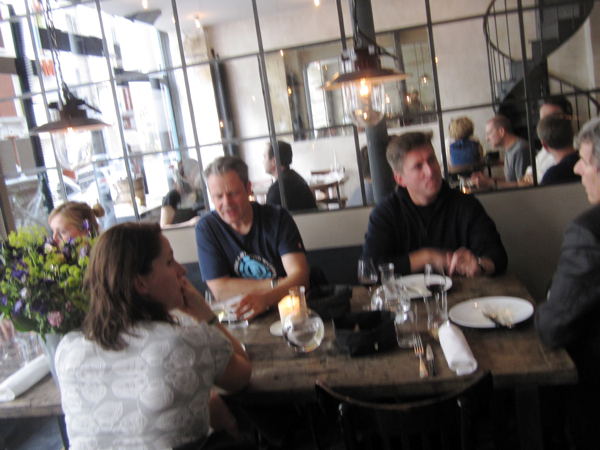 Like other colleagues in the neo-bistrot line, Grébaut has understood what is missing in Paris: exactly these kind of low-key places with light and delicious food for very reasonable prices. Places like “Frenchie’s” or “Yam T’Cha”, where you feel the clear intention to invent, without claiming to be producing art. Grébaut call it the "democratization of Haute Cuisine". The dishes are indeed minimalistic, fresh and satisfying. 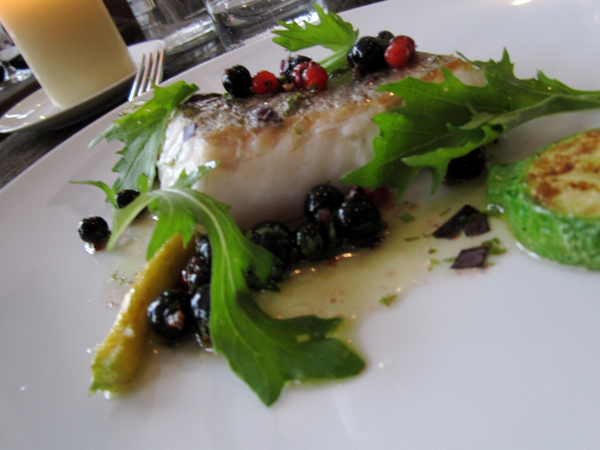 Take the hake with red and black currents: just lovely. The vegetables come carefully cut and sprinkled with fresh herbs or flowers. As I said, eating at “Septime” is like having a nice walk through nature. After a lunch for 26 € including wine or water you leave a happy person. Yes, good food might make us better people, sometimes. We've revisited the restaurant in late January 2013 and found no need to change our earlier review.